Astrophotographer Jeff Johnson sent in a photo of the Pleiades ("the Seven Sisters") taken from his backyard in southern New Mexico, Oct. 4, 2014. The Pleiades is currently visible in the winter night sky: to some, it looks like a group of bees chasing Taurus the Bull. If you look to the sky this week in the Northern Hemisphere, you may see a hunter and a raging bull charging toward him, surrounded by bees. Alas, the battle will never occur; like Orion, Taurus is forever frozen among the stars. Among the constellations, there are few more distinctive than the Bull. Like Cassiopeia, which resembles a "W" or an "M", Taurus looks very much like a long, narrow version of the letter "V." Sometimes, however, when trying to conjure up the allegorical pictures of the ancients against the background stars, you must use a little artistic license. For instance, the two bears in the sky possess tails that are far longer than any real bear found here on Earth. And in the case of Taurus, we have a bull with a pair of unusually long and straight horns, each tipped with a star. The brighter of the two horn tips — El Nath — is appropriately known as "The Butting One." The wedge-shaped face of Taurus is composed of a famous cluster of stars known as the Hyades. A cluster of this type is called an open cluster, because it has no obvious organization or symmetry. The stars move together through space like a family on a hike, seemingly both going across the sky and going away. The paths of the stars converge on a "vanishing point" far to the east. The resulting geometry allows us to determine the cluster's distance with some accuracy: 151 light-years. Its age is about 625 million years. But one of the most amazing coincidences in the sky is the near-perfect position of a bright, orange-red star positioned at the top left of the wedge. It looks like it's the brightest member of the Hyades, yet it is not related to them at all. That's Aldebaran, the bull's fiery right eye. In the overall scheme of things, Aldebaran's relation to the Hyades is that of an innocent bystander. At a distance of 67 light-years, it's nearly half as close to Earth as the Hyades and is moving toward southward, almost at a right angle to the cluster's motion, and twice as fast. So, Taurus' face is literally falling apart. Today, it resembles a near-perfect V, but in 50,000 years, it will be quite out of shape. Whenever I'm giving a live show at New York's Hayden Planetarium and I know there are a lot of youngsters in the audience, I'll ask the kids if they can tell me why they think Taurus is so angry. The possibilities they offer up are always rather interesting and too numerous to share here, but ultimately, I come up with the best explanation: He's being stung by seven bumblebees! I'll then point my laser pointer to a tiny cloud of stars off to the right (west) of the Hyades. Immediately I'll get a reaction of giggles or "Oh! I see them!" from the kids. Here is yet another star cluster — the tiny, yet distinctive star pattern known as the Pleiades. 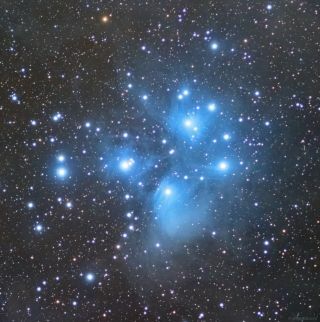 Popularly called the "Seven Sisters," the Pleiades resemble a little dipper. The Pleiades' naked-eye appearance was neatly described by the poet Tennyson as glittering "like a swarm of fire-flies tangled in a silver braid." Scientists recently showed that the Pleiades are about 400 light-years away and some 20 light-years across; the group may be no older than 20 million years and contains hundreds of stars. Several stars in the cluster seem to be enveloped in clouds of dust, perhaps left over from the stuff of which they were formed. Finally, do you or someone you know drive a Subaru? If so, note that your mode of transportation is named after the Pleiades: In Japan, the star cluster is known as subaru, which means "unite." The star cluster featured in the Subaru logo is known in Japan as mutsuraboshi, meaning "six stars." Once again, there's a Pleiades paradox: Seven Sisters represented by six stars, now even on the logo of a popular car.